CAJ has enjoyed a long history of excellence in music, being well-known and appreciated within our community and beyond. The department asserts that arts education, including music education, which gathers from and connects to learning in nearly every discipline, is of great importance in developing the whole person. We teach music not because we expect all children to major in it and not so they can relax or have fun, though these may, indeed, happen. We teach it so they can be human, so they will recognize the source of all beauty, so they will be sensitive, so they will be closer to God, so they will have more love, more compassion, more gentleness, more good — in short, more life. U: Use music to communicate. S: Serve God and others. C: Creativity imitates and glorifies Christ. 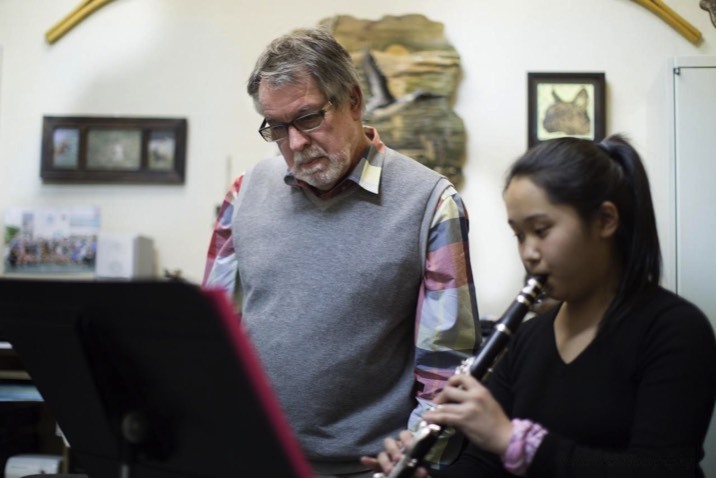 For many students, CAJ’s Music Department culminates in performance ensembles. These are possible because we are committed to teaching throughout the curriculum the building blocks of music reading, theory and history, and guiding students into discovering their God-given talents and honing their skills. This is all done to glorify the Lord, to reflect his beauty, and to deliver the message of his love through the medium of music. Scott Ponzani is the chairman of the Music Department, the Fine Arts Coordinator, and the high school choir conductor. He also directs the high school and middle school handbell ensembles. Scott has also been accompanist for Chamber Singers, taught private voice and piano lessons and worked in CAJ’s development and technology departments.